The first prioritisation meeting using this process took place in March 2015 and the second on 19 October 2015. Please note that the process was last run in 2017. The information is retained below as an archive. HQIP implemented a new process in spring 2015 to systematically prioritise which clinical care areas are covered by the National Clinical Audit and Patient Outcomes Programme (NCAPOP). The process builds on increasing engagement between HQIP, the National Advisory Group for Clinical Audits and Enquiries (NAGCAE), and the funding bodies (NHS England and the Welsh Government) to shape the overarching strategy for the programme. The first prioritisation meeting using this process took place in March 2015 and the second is planned for October 2015. In light of the current financial constraints and challenges faced by the NHS, it is vital each commissioning decision is taken systematically and in the context of the NCAPOP activity as a whole, to ensure highest possible value and impact of each project funded. HQIP has therefore worked with NHS England and the Welsh Government to establish the mechanism by which the future shape and content of NCAPOP will be determined. This includes a process by which existing national clinical audits and clinical outcome review programmes, as well as newly-proposed topics for inclusion, can be evaluated in the context of the overall NCAPOP portfolio. The twice-yearly prioritisation meetings provide a regular forum to consider the strengths of existing projects, the potential value of new topics, and both the ambitions and constraints for the programme moving forward. The decisions of the forum are transparently noted and communicated via these pages of the HQIP website. The details of this process are outlined below. The new standardised process for reviewing all audit and enquiry topics when they reached commissioning decision points is outlined below. Prioritisation meetings take place twice yearly in March and October to review topic decisions due in the context of the projected five-year NCAPOP budget. The key features of the process are that relevant stakeholders for existing and new topics under consideration are invited to complete a proposal form detailing the improvement goals of the project, the general approach proposed, the impact to date if the proposal is for a re-tender, and evidence of the degree to which the NCAPOP eligibility criteria are met. The NHS England Domain directors, the Welsh Government, HQIP and NAGCAE attend every prioritisation meeting. Each proposal is presented in a non-judgemental way by a senior HQIP member working with a NAGCAE representative, and the proposal is discussed fully by all attendees. After all topics have been considered, HQIP and NAGCAE score each one according to the eligibility criteria. The NHS England Medical Directorate SMT subsequently ratifies the final decision on each proposal. Development work is now beginning in preparation of procurement launch of these audit contracts and details of the planned schedule can be found here. In addition, it was agreed HQIP will work with the Royal College of Physicians and the British Society of Gastroenterology to explore how the Inflammatory Bowel Disease audit can be supported to transition to future data collection through the new IBD Registry. The NCAPOP topic prioritisation meeting was held as planned on 19 October 2015, supported by HQIP, the NHS England Domain Directors, the Welsh Government and members of the National Advisory Group on Clinical Audits and Enquiries (NAGCAE). At the meeting, each topic proposal was discussed in detail and the merits and value of the national programmes operating in each topic area were recognised. The conversations highlighted the importance and impact of each and every topic under consideration and a prolonged period of internal discussion in NHS England ensued given the current financial environment described below. The NCAPOP as a whole has grown steadily for a number of years in scope and ambition, as well as impact. However, one result of this growth was that at the start of 2015/16, financial projections for the Programme indicated over-commitment in future years. At the same time, budgetary constraints across the NHS have required healthcare providers to achieve financial savings, and NHS England indicated early in 2015 that similar savings would be required from NCAPOP project-level spend under contracts awarded from 2016. The decision for topics considered at the 19th October prioritisation were confirmed in January 2016. All topics considered at that meeting will be re-commissioned, however, each NCAPOP contract will see a reduction in funding in line with all budget revisions. Reductions will be of the order of 15%, but some larger programmes or those where topics may be commissioned as a new single programme will see a greater reduction. The following table provides an indicative timeframe for commencement of the commissioning and procurement for the topics from both the March and October prioritisation meetings. The schedule may be subject to change. Further information on HQIP tender opportunities can be found here. Four National Clinical Audit topics are due commissioning decisions in spring 2016: Emergency Laparotomy, COPD, Vascular Surgery and Prostate Cancer. All four are coming to the end of their very first NCAPOP commissioning period and the re-commissioning decision will be taken on a case by case basis within HQIP’s specification development process. 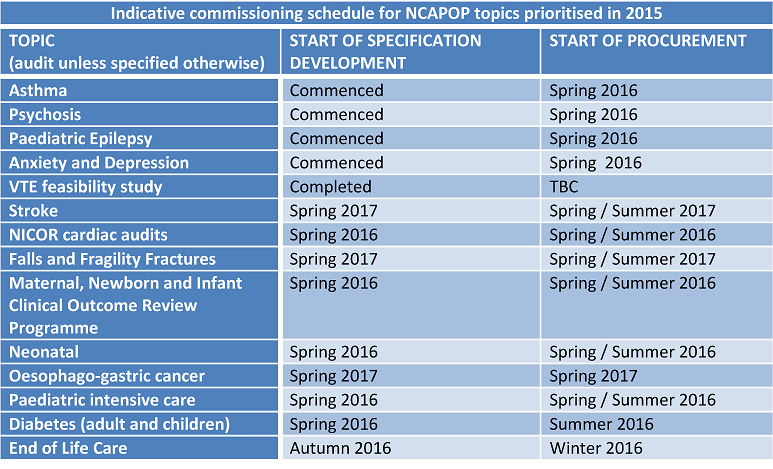 During spring 2016 NHS England, HQIP and NAGCAE will review the NCAPOP prioritisation process ahead of the October prioritisation meeting. This meeting is anticipated to take place as planned. Further details including the topics for consideration will be provided in spring 2016. An early stage in the in the commissioning process is the development of high-quality service specifications against which tender returns can be invited. The specifications need to reflect the funding bodies’* policy drivers and commissioning requirements for the project and are developed from a topic proposal which has been prioritised by the funders. In addition, those programmes with independent advisory groups (IAG) will reflect the IAG’s recommendations for the programme informed by lessons learned from the delivery of the programme to date and proposed future direction. The overall aim of each specification development meeting (SDM) is to support a review of the key design features embodied in the topic proposal against the funders’ commissioning requirements, discuss the associated risks and consider whether any elements need to be refined or added to. Attendees include representatives from relevant patient and professional groups, experts in NCA delivery, representation from NICE and the CQC, representation from NHS Trust audit departments, NAGCAE, and clinical and policy leads from the funding bodies..
HQIP then uses the output of this meeting when drafting the project specification. No attendee of the meeting with the potential to be part of a future tender return will be able to have sight of the specifications until the tender packs are sent out, so as not to gain any unfair advantage during this process. Relevant information or materials along with a summary of the minutes are made available to all interested parties when the tender is launched. * NHS England and the funding bodies of the health departments of the devolved administrations of Wales, Scotland, Northern Ireland, and the crown dependencies of Jersey, Guernsey and the Isle of Man as applicable.